Happy birthday to one of the world’s most clever and whimsical illustrators and authors….. Quirky, prolific, and a true talent. I still adore you, Mr. Gorey! For a fantastic book detailing the inner workings of Gorey, pick up Elephant House or, The Home of Edward Gorey. For more information, visit their website. Thanks for remembering a truly unique artist. After seeing his drawing as the lead in to PBS “Mystery” I started collecting books with his drawings. You can find his drawings on calendars and I regularly pull out my 2005 calendar “The Evil Garden” and delight at words and illustrations – “Great-Uncle Franz, beside the lake, is being strangled by a snake” is the page for June. I LOVE “The Evil Garden”! I’ve been wanting to get a Limited Edition lithograph for decades… I’ve seen them for sale, and drooled. I professionally framed a Gashlycrumb Tinies poster. Either you love him…or you simply don’t empathize with the whimsy. You’d love his Elephant House — just fascinating. Gorey is one of my all-time favorites. Though i shudder a little to think of an entire book about his inner workings! Yaaaaaaay! You should buy this book… It’s brilliant! A picture book with fantastic text, about his home and creative process. As an artist, you would LOVE IT. Ooo, what fun. the book. We don’t often get to hear about a creative process–just see the final product. I’m off to the library, so shall look it up. Just found it in the library and have put it on hold! Early next week I shall be leafing through a fabulous book. yaaaaaaay! Oh, hoorah! I’m so glad… I know you’ll enjoy!! It provides such wonderful insight, and that rare glimpse. Yes, that is what I remember–it makes me feel in good company–odd bits and bobs that have good bones, so to speak! rocks, lots and lots of rocks! I think I’ve seen parts of his collections–no wonder I like his art. Doesn’t he collect odd bones and string, rocks…. ?? Thanks so much for the hearty recommendation, FG! Did you see that Google reworked their logo today in Gorey style! I’m a big fan too; he never fails to make me laugh, how evil! My favorite is The Doubtful Guest. I DID!! Didn’t they do a fantastic job? I love it…. Thanks so very much! 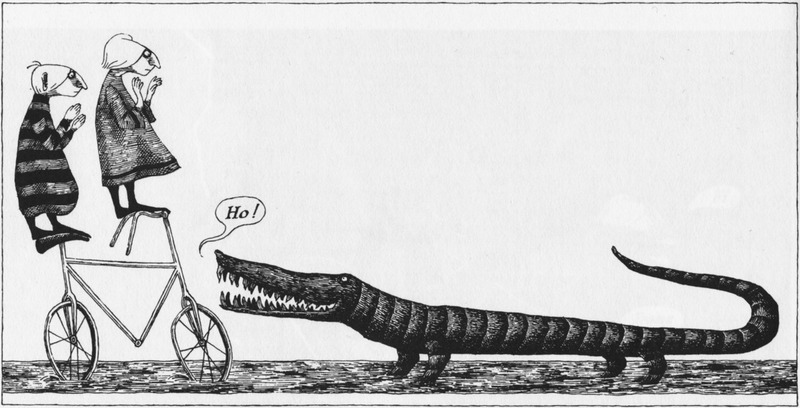 I love Gorey, and had to include one of his gators on this blog… Of course! THANK YOU FOR THE INTERESTING INTRODUCTION TO NEW ARTISTS!! !